Park Court ~ Balham Park Road - a Memory of Balham. My Aunt & Uncle (Ella & Cecil Forbes) lived in a two bedroom flat in Park Court in Balham Park Road from 1948 & throughout the 1950s and I spent much time staying with them as my parents ran pubs in The City. Uncle Cecil worked for Mullards as an engineering draughtsman and Auntie Ella was a 'housewife'. As they were 'well off' by comparison with 'us' they owned a 9" screen TV set which we would drive over specially from our rather seedy flat in Roehampton to watch on frequent Saturday evenings! This TV had cost them 60 guineas [HEAVILY staff discounted!] direct from Mullard's factory and 60 guineas [£63] was simply a fortune back then... Uncle Cecil had a really 'GOOD' job then and earned about £10 per week! We'd sit glued to TV until the intermission [the potter's wheel, remember?!?] when up would go the lights and tea would be served by the ladies...like being at the cinema it was!!! I SO well remember the 'old boy' who'd be on the corner of Balham Park Road and Boundaries Road EVERY Saturday morning; he'd play mournful tunes on a battered flute and passers by might put a penny in his begging bowl, and he'd busk stolidly on beneath a big lime tree which provided little protection from the not infrequent rain and the whole exercise was SO utterly depressing and made worse by the Spiritualists' Hall [long-gone now and replaced with smart flats I see on Google!] that was on the opposite corner of Boundaries Road. On Thursday evenings the avid spiritualists would convene there for an evening of seances and ectoplasm and this was regarded as not at all acceptable by my Aunt and Uncle who poo-poo-ed such extravagant behaviour. The Hall was a low green corrugated-roofed and tree-enshrouded 'hut' and it always terrified me as I KNEW all those evil spirits MUST live in it at ALL times and were up to no good! Du Cane Court alweays fascinated me and my Uncle & Aunt would love to have moved there but for its expensiveness which was beyond their means. I see it's the largest privately owned block in Europe no less, and was reputed to be where Mr. Hitler would set up shop once Blighty had succumbed to the JackBoot! I could 'go on' a lot more about fishing on the sad local park pond with my uncle, about the veg. seller 'neath the Boundaries Road rail bridge...."Taters Onyuns & Carruts lady......ALL a penny h'apenny a pahnd".....about the fabric shop in the High Road with the Lampson system of conveying your payment to the office by means of a canister propelled by a noisy vacuum tube........something to fascinate any ten year old boy! Ahhh....THOSE were the days .......or WERE they?! I wonder if I watched the Coronation in your Uncle's TV? My Grandparents lived at no. 9 Park Court and we went to a neighbours flat to watch the Coronation, which I found very boring, I was two years old, but I remember going out onto a balcony afterwards. Well, I'm now 76 and live in the suburbs of Melbourne, Australia. 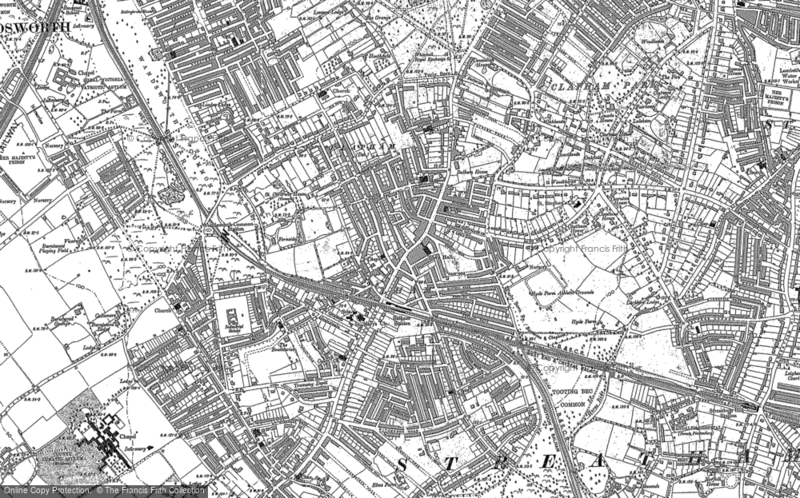 I used to live at 24 Upper Tooting Park and went to Balham Grammar School on Balham High Road from, I think, 1950ish through to 1956ish (Headmaster : Percival Francis Thompson) when, with my Mother and Step Father,we moved out to Hertfordshire. I used to do a paper round in DuCane Court when Tommy Trinder was living there and the place was considered "posh". My mother worked at Sainsbury's just up from Balham Rail Station and from there she went to work at Hurleys in Balham High Road. I was in the 1st Wandsworth Common Cubs/Scouts and then went to the Balham and Tooting Sea Cadet Corps down near Tooting Broadway. (I subsequently joined the R.N.). I recently looked at Upper Tooting Park on Google and it looks more like a major thoroughfare now whereas I remember it with the United Dairies Horse and Cart Milkman. Happy Days from long ago. Signed Michael Murphy or Michael Hart as I was then.